We take an unusual look at our nearest neighbour in the Solar System, the Moon. Watch it rise, with some unanticipated activity in the foreground, and then ponder some things you may not have considered before. 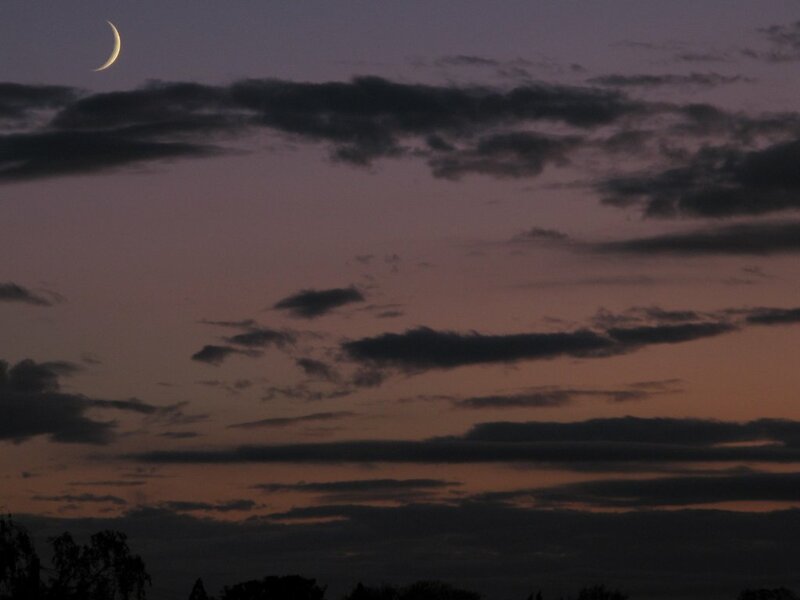 This remarkable video by Australian Mark Gee shows the Moon rising in an unexpected way in the New Zealand evening sky. There are many things to notice about this scene and I'll go through them below the embedded video. But please watch it first, you will not be disappointed! You can watch it right here on the page. But I strongly recommend that you click the full screen control (the four arrow symbol at bottom right) and if you have a good internet connection, also make sure you view it in HD. Come back here after you watch it, scroll down the page a little, and we'll talk about what you have just watched. Big Moon or small people? - Mark was using a good telephoto lens here. Imagine looking at a nearly full Moon rising above a distant hill line with people walking along the ridge. They'd be silhouetted against the bright Moon but they be almost too small to see. 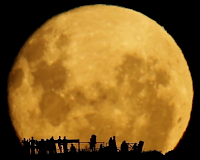 In this shot both the Moon and the people are magnified by the same amount. Fuzzy and shimmering Moon - Look at the edge of the Moon. Do you see the constant disturbance of what would should be a sharp and smooth edge? This is due to temperature differences along the line of sight. The density and refractive index of the air depend on temperature. You can see the same effect above a road surface on a hot day, or above a hot roof. Objects behind the shimmering air wobble and move continually. Steady people - Take a careful look at the people and the grass and the fence line. Are they shimmering too? No! But why not? The answer may not be immediately obvious. There's a great distance of air between the camera and the Moon, much less between the camera and the people. Most of the disturbed air is way beyond the people, between them and the Moon. Where's the Sun? - As a full Moon rises, the Sun sets on the opposite horizon. At times other than full Moon this is not the case. Sometimes both Sun and Moon will be in the sky at the same time. At other times both may be below the horizon. New Moon, when they are both in the same part of the sky, is a good time for astronomers because the sky is nice and dark all night long. So why is there no sunlight? - If the Sun is setting as the full Moon rises, why can't we see its light on the people and the vegetation? If you'd been there at the time you'd have thought the sky was quite light, there may indeed have been a lovely glow behind you as you looked at the Moon. But the full Moon would have been brighter than the remaining light from the Sun and the camera was set to record the Moon, not the people. Also, this Moon is not perfectly full. Notice that the right-hand edge of the Moon is sharper and brighter than the left-hand edge. The Sun had already dipped below the horizon before the Moon made its appearance. Isn't the Moon moving the wrong way? - In the UK where I live, the Moon moves steadily to the right as it rises. But this Moon moves steadily left! Why? It moves to the right in the USA too, and indeed anywhere north of the equator. But in the southern hemisphere the Moon moves left. If you're a northerner imagine standing on your head. Now which way would the Moon seem to move - left or right? It moves from east to west wherever you live. And it's upside down! - Indeed it is. But so are Australians. Or we northerners are, it depends who you ask. It's more yellow than I expected - That's because it's made of well-matured cheese. I thought everyone knew that. The real reason is that we are looking at it through a lot of atmosphere. Air scatters blue light (which is why the daylight sky looks blue). Near the horizon both the Sun and the Moon appear yellow or orange, or even reddish. As they rise higher they have less and less air to shine through so the orange effect is lost and a Moon high in the sky appears white (though in fact it's a rather dark grey). The night sky is dark and the Moon appears intensely white because of the high contrast. More about the video - Mark Gee tells the story of making this video in his own words; it's well worth reading so do go and take a look. Mark's video was made on 28th January and featured on 'Astronomy Picture of the Day' (APOD) on 30th January. We live in a truly astounding universe. What is the most amazing thing you have ever seen? 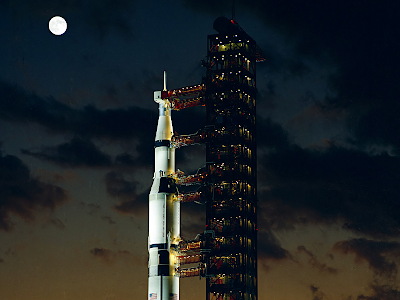 Are you surprised to see how fast the Moon rises? How do you feel when you watch this video?